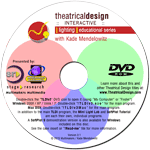 Available to buy online, Theatrical Design Interactive is a line of interactive learning tools for the development of knowledge and skill in the art and practice of lighting, sound, or makeup design for the stage. 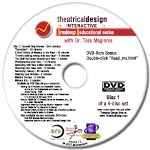 Utilizing audio, graphics, video, animation, text and a powerful and intuitive interface, a student discovers and implements the very practical skills of designing for the stage while they control the pace! Our titles are available through us directly (via PayPal or Square), Stage Research and Amazon. 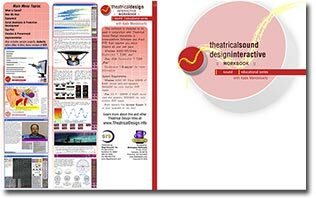 Workbooks now available for Lighting and Sound Design! Click on the cover image to download a PDF preview of the workbook. Lighting is 86 pages, Sound is 42. Updated for Version 3; 86 pages! 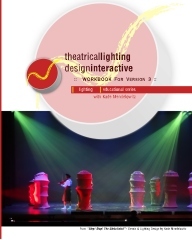 A great companion for "Theatrical Lighting Design Interactive", this workbook is like a college course syllabus and lesson plan, stepping you through the process of designing the lighting for 2 productions. There have been visitors to this page since March 24, 2007. Thank you for checking us out! Home - Lighting - Sound - Makeup - Register - Shop!